For other uses, see Monoceros (disambiguation). Visible at latitudes between +75° and −90°. Monoceros (Greek: Μονόκερως) is a faint constellation on the celestial equator. Its name is Greek for unicorn. Its definition is attributed to the 17th-century Dutch cartographer Petrus Plancius. It is bordered by Orion to the west, Gemini to the north, Canis Major to the south and Hydra to the east. Other bordering constellations include Canis Minor, Lepus and Puppis. Monoceros is not easily seen with the naked eye, containing only a few fourth magnitude stars. Alpha Monocerotis has a visual magnitude of 3.93, slightly brighter than Gamma Monocerotis at 3.98. Beta Monocerotis is a triple star system, the three stars forming a triangle which seems to be fixed. The visual magnitudes of the stars are 4.7, 5.2 and 6.1. William Herschel discovered it in 1781 and commented that it is "one of the most beautiful sights in the heavens". Epsilon Monocerotis is a fixed binary, with visual magnitudes of 4.5 and 6.5. S Monocerotis, or 15 Monocerotis, is a bluish white variable star and is located at the center of NGC 2264. The variation in its magnitude is slight (4.2–4.6). It has a companion star of visual magnitude 8. V838 Monocerotis, a variable red supergiant star, had an outburst starting on January 6, 2002; in February of that year, its brightness increased by a factor of 10,000 in one day. After the outburst was over, the Hubble Space Telescope was able to observe a light echo, which illuminated the dust surrounding the star. Monoceros also contains Plaskett's Star, which is a massive binary system whose combined mass is estimated to be that of almost 100 Suns put together. The nearest known black hole to our Solar System is in this constellation. The binary star system A0620-00 (abbreviated from 1A 0620-00) in the constellation of Monoceros is at a distance of about roughly 3,300 light-years (1,000 parsecs) away. The black hole is estimated to be 6.6 solar mass. Monoceros contains two super-Earth exoplanets in one planetary system: COROT-7b was detected by the COROT satellite and COROT-7c was detected by HARPS from ground-based telescopes. Until the announcement of Kepler-10b in January 2011, COROT-7b was the smallest exoplanet to have its diameter measured, at 1.58 times that of the Earth (which would give it a volume 3.95 times Earth's). Both planets in this system were discovered in 2009. The Rosette Nebula (NGC 2237, 2238, 2239, and 2246) is a diffuse nebula in Monoceros. It has an overall magnitude of 6.0 and is 4900 light-years from Earth. The Rosette Nebula, over 100 light-years in diameter, has an associated star cluster and possesses many Bok globules in its dark areas. It was independently discovered in the 1880s by Lewis Swift (early 1880s) and Edward Emerson Barnard (1883) as they hunted for comets. The Christmas Tree Cluster (NGC 2264) is another open cluster in Monoceros. Named for its resemblance to a Christmas tree, it is fairly bright at an overall magnitude of 3.9; it is 2400 light-years from Earth. The variable star S Monocerotis represents the tree's trunk, while the variable star V429 Monocerotis represents its top. The Cone Nebula (NGC 2264), associated with the Christmas Tree Cluster, is a very dim nebula that contains a dark conic structure. It appears clearly in photographs, but is very elusive in a telescope. The nebula contains several Herbig–Haro objects, which are small irregularly variable nebulae. They are associated with protostars. NGC 2254 is an open cluster with an overall magnitude of 9.7, 7100 light-years from Earth. It is a Shapley class f and Trumpler class I 2 p cluster, meaning that it appears to be a fairly rich cluster overall, though it has fewer than 50 stars. It appears distinct from the background star field and is very concentrated at its center; its stars range moderately in brightness. Hubble's Variable Nebula (NGC 2261) is a nebula with an approximate magnitude of 10, 2500 light-years from Earth. Though it is named for Edwin Hubble, it was discovered in 1783 by William Herschel. Hubble's Variable Nebula is illuminated by R Monocerotis, a young variable star embedded in the nebula; the star's unique interaction with the material in the nebula makes it both an emission nebula and a reflection nebula. One hypothesis regarding their interaction is that the nebula and its illuminating star are a very early stage planetary system. IC 447, a reflection nebula. In Western astronomy, Monoceros is a relatively modern constellation, not one of Ptolemy's 48 in the Almagest. Its first certain appearance was on a globe created by the Dutch cartographer Petrus Plancius in 1612 or 1613 and it was later charted by German astronomer Jakob Bartsch as Unicornu on his star chart of 1624. German astronomers Heinrich Wilhelm Olbers and Ludwig Ideler indicate (according to Richard Hinkley Allen's allegations) that the constellation may be older, quoting an astrological work from 1564 that mentioned "the second horse between the Twins and the Crab has many stars, but not very bright"; these references may ultimately be due to the 13th century Scotsman Michael Scot, but refer to a horse and not a unicorn, and its position does not quite match. Joseph Scaliger is reported to have found Monoceros on an ancient Persian sphere. 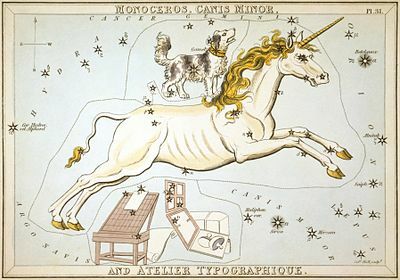 French astronomer Camille Flammarion believed that a former constellation, Neper (the "Auger"), occupied the area of the sky now home to Monoceros and Microscopium, but this is disputed. Chinese asterisms Sze Fūh, the Four Great Canals; Kwan Kew; and Wae Choo, the Outer Kitchen, all lay within the boundaries of Monoceros. ^ Wilkins, Jamie; Dunn, Robert (2006). 300 Astronomical Objects: A Visual Reference to the Universe (1st ed.). Buffalo, New York: Firefly Books. ISBN 978-1-55407-175-3. ^ Levy 2005, p. 104. ^ Levy 2005, pp. 82-83. ^ Levy 2005, p. 83. ^ Levy 2005, p. 85. ^ Levy 2005, pp. 105-106. ^ Ridpath, Ian. "Jacob Bartsch and seven new constellations". ^ Ideler, Ludwig (1809). Untersuchungen über den Ursprung und die Bedeutung der Sternnamen: Ein Beytrag zur Geschichte des gestirnten Himmels. Berlin. pp. 354..355. ^ Himmels Lauffs Wirkung und natürliche Influenz der Planeten Gestirne und Zeichen aufs Grund der Astronomie. Frankfurt. 1564. ^ Allen, Richard Hinckley (1899). Star Names – Their lore and meaning]]. Dover. p. 290. ^ a b Allen, p. 290. Ridpath, Ian; Wil Tirion (2007). Stars and Planets Guide. London/Princeton: Collins/Princeton University Press. ISBN 978-0-00-725120-9. Wikimedia Commons has media related to Monoceros.